A new step is now available in the Wraith Resurgence plot. The Meerca (formerly the Deathball Wraith) has arrived in the Infirmary! This is the same format as curing the Jetsam, you can use spare potions from Taelia (again, not on Firefox or most mobile browsers). The twist this time is that the Meerca will take donations from two potions - Concoctions II and III. The achievements are similar to the Jetsam's - however this time you need to donate six potions. This can be a mixture of the two Concoctions, it does not have to be 3 of each. The final achievement - One of (Every) Kind, remains unavailable. The cap of 35 on Wraith ingredients from the Battledome is also still there. You may also notice new dialogue added to the Infirmary page - it seems the Jetsam is cured! Our guides are now updated with the new information. I still haven't gotten past unlocking the chest from last time, so I don't know if there's a point in me continuing any further. I hate that chest! Trick that worked for me: Do it one time, without refreshing, no matter how many misses, and get it open. You will get the challenger and can go on. Then you can go back to get the achievement later. The achievement only takes a million tries. *lol* Where you click doesn't matter, but I found moving cursor down one row at a time helped me. Also don't rush. Good Luck! The patients are so cute and realistic. Excellent art! You actually don't even need to move the mouse around. You can click the middle circle to connect the pieces. Helps a whole lot when you don't have to be accurate with mouse position. I guess the six potions is all I'll donate to get the prizes. Since we still have that cap of 35, I better hold on to the rest of the ingredients in case we need to make more potions to clear fog in future plot steps, plus we have another patient to heal. Is their any mobile browsers it does work on? The cap is really bothering me at this point. I mean it SAYS EXPLICITLY that every potion counts yet if we really want to do more than the minimum we have to buy them on the wiz and its not cheap. I feel like that's just wrong. I have been getting it to work in Firefox. And we can still give potions to the Jetsam, his green bar is not all the way full. I'm going to assume that since the Jetsam needs potion 1, and the Meerca needs potions 2 and 3, that the Shoyru will need 4, 5, and 6, and whichever one is after that will need 7, 8, 9 and 10. We already know there will be 10 potions. I got it to work in Firefox, I just had to go back to HQ between each potion. Not too big of a deal if you are only doing a few cures, but it would be a pain if you were doing a ton to get extra points. I did donate a bunch of extra potions in Firefox. I didn't have to go back to the HQ, I just hit backspace after each potion and most of the time it worked. Dragging the bottle to cover the pets' faces seemed to work the best. How am I supposed to heal the Meerca if I can't get any ectoplasm to make concoction III? You can donate all concoction 2 if you like, no ectoplasm needed. @mistyraider, all the potions and ingredients are shown on Taeliea's table at the Brewing Centre. We only have one ingredient left (Wraith Blood), and four more concoctions. I see they fixed the images of the potions in the infirmary. Poor guy... We should have the ability to give gifts, (especially neggs to this Meerca), to the patients. Even if the items are r101 items, they would still give you plot points in the end. Are people having trouble getting the Winged Palm Blade? Or did everyone already get theirs from that glitch? I want to buy one but there aren't any for sale. @garfieldo, the Winged Palm Blade is "no trade" so you can't buy one. I got one during the plot, but from opening the 3rd chest and not from any glitch. It does work on firefox. You just have to hit F5 a couple of times to the the meerca to take it. Do the items only drop with your regular battling (15 item limit) now? Because I don't think I've hit my limit on Essences and I am getting zilch. @purplebin It seems it is in fact no trade, as mine is, but I have absolutely seen at least one for sale on the TP, and tried to buy it, but they accepted a different offer. Was that a glitch? @garfieldo, now that I think about it, there was a brief glitch where the Winged Palm Blade was being awarded as a regular item, and a number of people got it before it was shut down for a while. The woods seem to be open again, at the end I found Fyora sitting on a tree. Quote: There she is! But what happened to her?! You call out to her, but she doesn't respond. You better get her to Taelia, quick! "As you enter, you see one of the palace guards gesturing for you to leave. "Fyora isn't here. This shop is closed." You want to ask him about Fyora, but he doesn't seem interesting in talking (and more than a little scary) so you head back out." There has also been talks about the HT being closed for good. I don't want it to close at all! What do you guys think? Did you guys know if you click on the redcross at the tent you can see how much you have donated to each pet? Also the Jetsam is now fully healed. I think this means we have no further use for the Concoction I, although the newer ones might require some Wraith Ectoplasm. I hope so, because I have some left. How long did it take after the last Wild Woods step for there to be a new wraith to battle? It didn't seem like more than a day or two, but I'm wondering because there should be more coffers to collect. I got coffers yesterday but none today anyone get any? Based on the original War Booty Chest colors, the next coffer should be a mossy green color. I'm not sure what to call it. 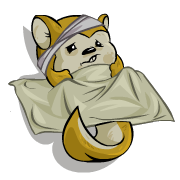 I can only heal Fyora as of today, not the Meerca. Does this mean it's healed and I can't do that step? There are 35 comments above. Why not post yours?